When summer and fall collide. These few blended weeks as we switch from one to the other. The tomato plants are heavy and reach down to the earth, where they mingle with the leaves that have traded in their green for gold and fallen to the ground. It's only days apart that we are opening our windows to catch the cool breeze, and then lighting the first fire as the mountains collect their snowfall. And bake and bake and bake. But we still have summer produce begging (please!) to not be forgotten. So I decided to join the two. Summer meets fall, mixed together in a loaf of warm bread. this bread is 100% whole wheat, and lightly sweetened. I don't like overly sweet breads (I'd rather add a bit of honey as I eat it if I need to.) 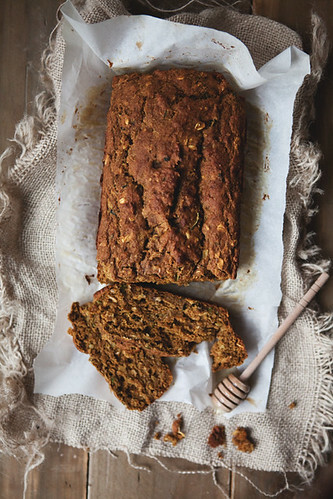 If you like your bread on the sweeter side, you might want to boost the sugar (honey) a bit. Preheat oven to 350 degrees. Grease and lightly flour one 9x5 loaf pan. In a separate bowl combine all dry ingredients and mix. In a mixer, combine browned butter and honey. Mix in eggs until well combined, about 1 minute. Mix in pumpkin puree, zucchini, and vanilla until thoroughly combined. Slowly add in dry ingredients, a little at a time, until just mixed in. Do not over mix. Pour into pan and place on bottom rack of oven, and bake for 40-50 minutes, until toothpick inserted into center comes out clean. I love this post! So so true. Love the bread recipe & how you have summer meeting fall. It seems like the two are duking it out, and that's my favorite time of year! Thank you for sharing this recipe. 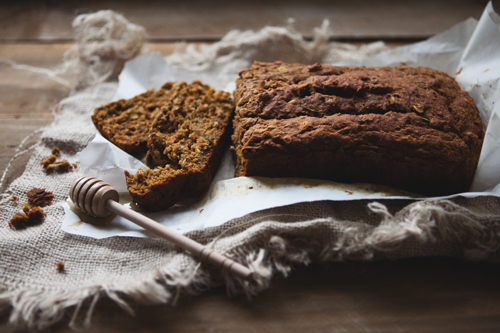 Just yesterday I was looking at a zucchini in my fridge and wanting to use it, but I craving pumpkin bread as well. Problem Solved. You're killing me! That looks amazing. This recipe seems pretty perfect. I'll be making it this week! I will definitely be making this bread! Thanks. I've got a very interesting article to share with you today. It?s from my good friends and fat loss cooking experts Dave and Karine from MetabolicCooking. 2. How to ensure your meals are optimized for fat loss! I'm telling you, this is GOLD! But that's not all. Another thing to consider is whether or not your so-called ?healthy? cookbook has a real structure. Too often, cookbooks are just a bunch of recipes thrown together at random ? you pick and choose what you feel like eating at that point in the day. That is NOT going to make you burn fat faster! So we?ve talked about the food and the structure of your eating plan. Sounds like we?ve got it covered, right? NO! Ever followed a diet to a ?T? and all of a sudden noticed that you stopped losing fat?